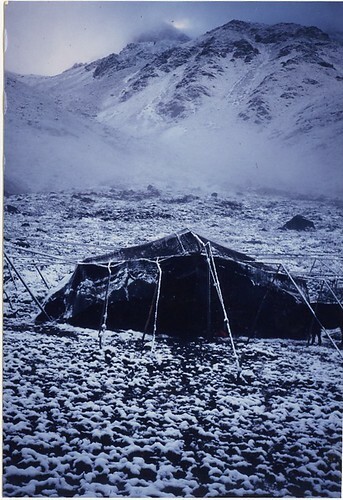 black tent1, originally uploaded by mutikonka1. After the first long a sore day in the saddle, as it got dark I began to wonder where we would be staying. Then, a dot on the hillside far away slowly came into clearer focus. 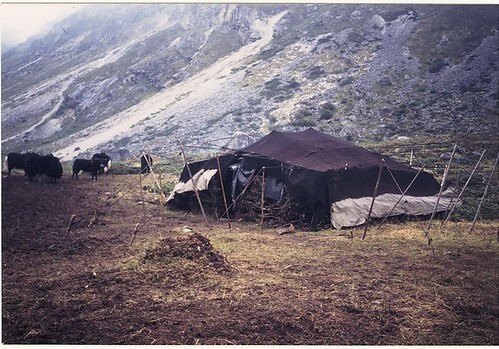 I was a black yak hair tent being used by some yak herders as their "summer" accomodation. 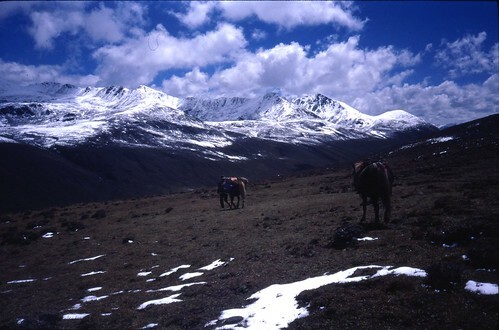 They grazed their yaks in the high pastures at 14,000-16,000 feet in the "warmer" months of June to September, before snow drives them back down to the relative lowlands of 10-12,000 feet. On this occasion we squeezed in with the tentants of this black tent for the night. 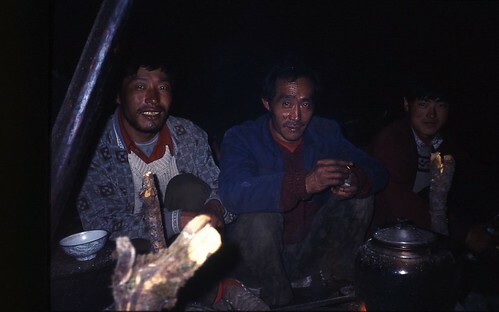 The floor was hardened mud and much of the tent was filled with smoke from the fire, giving me the characteristic Tibetan red-eyed look within an hour. 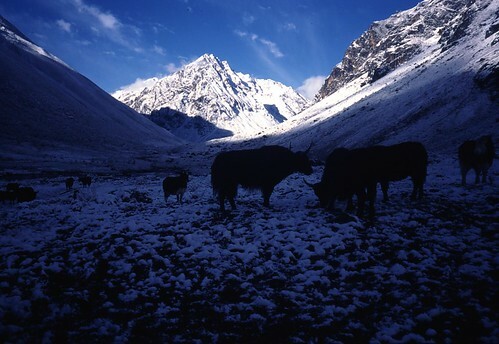 As night fell it began to snow and the yak herder brought in the yak calves to share one corner of the tent with me. 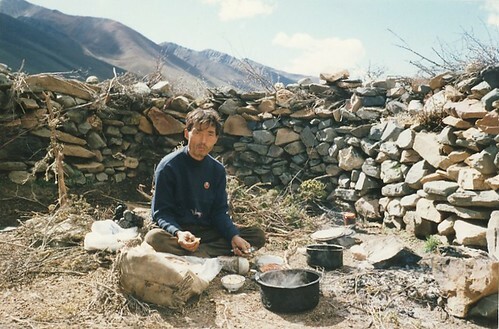 The herders cooked up some noodles with chilli in their huge cooking pot, and this was complemented with the usual tsampa and some dried yak meat - kind of like beef jerky. I rolled out my bivvy bag on the muddy floor and amazed them by taking off my contact lenses - they thought I was taking my eyes out for the night. Before we dropped off they cranked up some karaoke on a battery operated ghetto blaster and the men knocked off half a bottle of baijiu [rocket fuel spirits]. 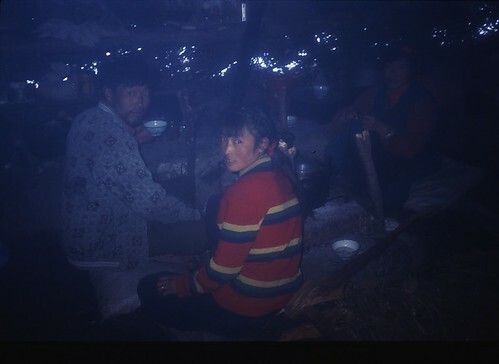 Interior view of our cramped but cosy black tent. The weave of the hair is quite loose, allowing in a bit of light - and the wind!. When it rains, a few drips of rain to get through. But when it rains heavily the yak hair swells, closing the gaps. 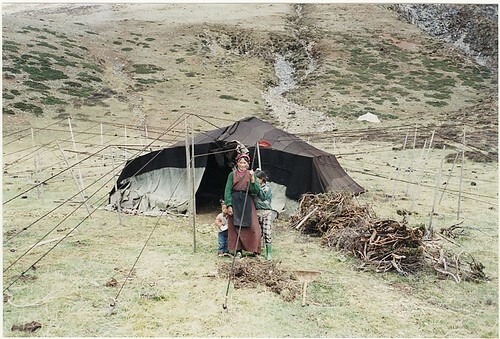 Another view of the typical yak hair herder's tent. Vicious guard dog not pictured. 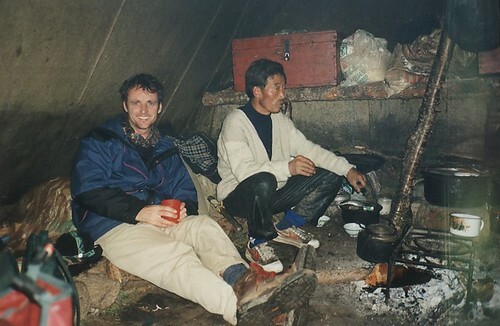 My guide Ger-ler having a cup of yak butter tea in the tent. You can see some of the gaps that let the wind and rain in. Ger'ler with our hosts in the black tent. The following morning I woke up freezing cold, despite my down sleeping bag, air mat and bivvy bag. 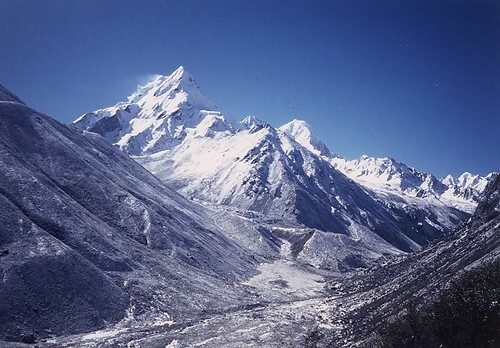 The snowfall during the night had transformed the landscape into a wintery but beautiful mountainscape. This was the bitingly cold view I got when I first emerged from the tent. 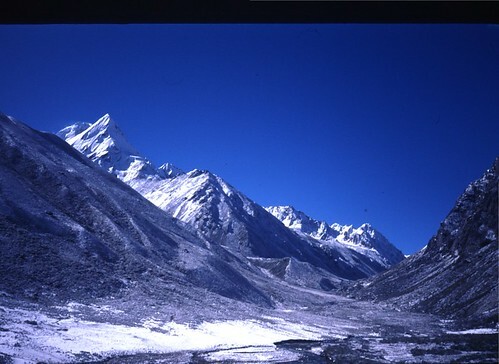 It is looking towards the Djesi Pass and the mountain called Chiburongi. The sun has only just touched the top of the peaks. As we set off towards the Djesi Pass, the mountain Chiburongi came into view. This is a snap I took of Chiburongi on the way up to the Djesi La. 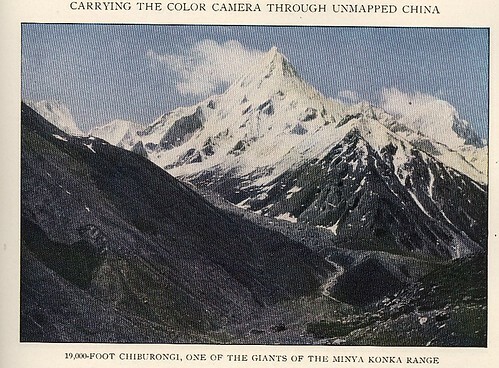 This is the same view captured by Joseph Rock with his autochrome colour prints 80 years earlier. As we crossed over the Djesi La, we entered the top end of the Yulongsi valley. It was weird. There were vultures hopping about on top of the pass, and just after we descended a huge grey cloud billowed over the pass behind us and chased us down the hill like it was alive. We tried to outrun it, but it was soon on us and enveloped us in a blizzard. It was a complete whiteout, and I thought we'd had it. But as suddenly as it appeared it cleared up and seemed to vanish into thin air, leaving only a light mist and a small fall of snow that soon blew away. Here I am on the ridiculously small pony. With my long western legs buckled at 90 degrees to fit into the stirrups I found it excrutiatingly uncomfortable to ride for several hours a day. I also had the most skittish nag, which would buck and try throw me off every hour. It eventually succeeded in doing this just over the pass, and I thought I'd broken my arm for a while. Fortunately it was just bruised, and I swapped with my guide for a much more placid horse. 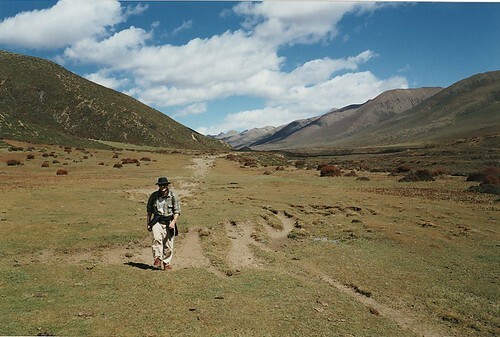 As we descended into the much flatter Yulongsi valley I decided to walk to relieve my aching backside and calf muscles. The sheer size of the landscape was just overwhelming - it just went on and on for hour after hour of nothing. There were no signs of human life here at all. 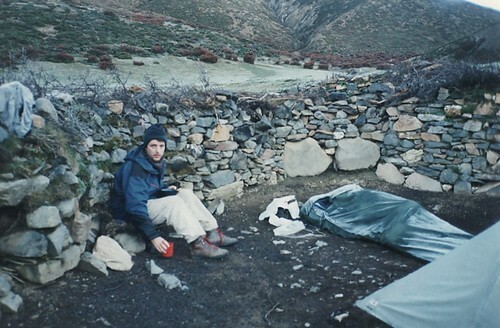 For our second night in the hills we camped at the top end of the Yulongsi valley at the foot of the Djesi La. 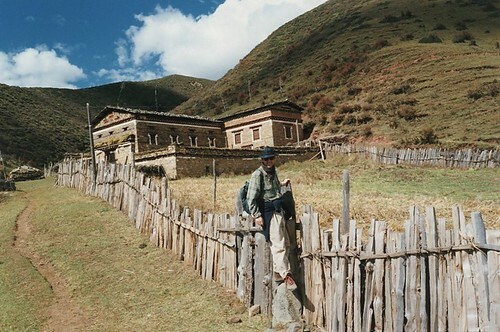 Here is my guide Gong Xianyao, in the sheep pen that we used for shelter. He had no sleeping bag - just a camp roll. I don't know how he survived the night in those freezing temperatures, but he refused all my offers to share the tent. When we woke the next morning it was again bitterly cold. The frost-covered shape in the bodybag is Keith Lyons, who was not surprisingly even colder than I had been in the tent. God knows how our guide survived. We were alarmed to find that he and horses had gone. We thought he'd done a runner, but he re-appeared mid morning to tell us that the horses had been scared off by a wolf in the night. It took us most of the morning to find them, high up on a ridge overlooking the valley. Looking for the horses we climbed this ridge that must have been between 16,000 and 17,000 feet high. It did me in but the view over to Minya Konka was worth it, in retrospect. 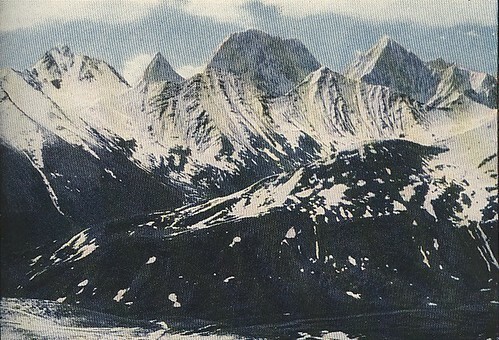 Here is a more close up view taken by Joseph Rock of the same range in 1929. 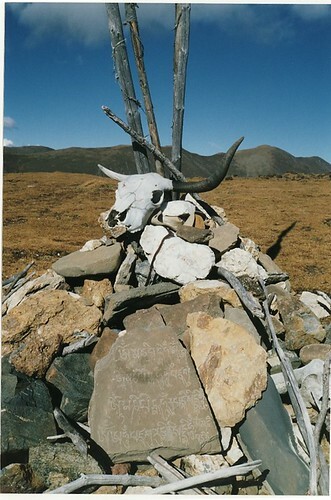 At the top of the ridge there was a kind of pass where some Tibetans had erected a cairn decorated with a yak skull and some stone carvings. Here is a detail of the stone carving on the cairn. At the end of the second day in the hills we at last arrived at the inhabited middle section of the Yulongsi valley. Here our guide knew some people we could stay with in a real house. This is the house where we stayed in Yulongsi before attempting the journey over the Tsemi La. 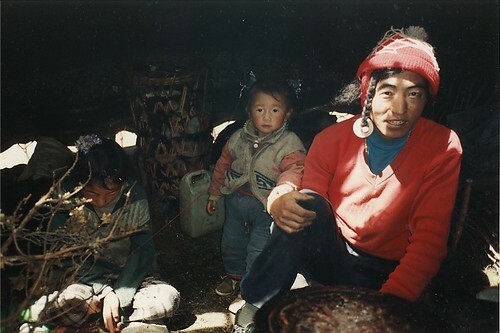 It was a typical Tibetan dwelling, with the ground floor reserved for animals, and a notched log leading up to the cavernous dark first floor where we sat around a fire place on tiny stools. 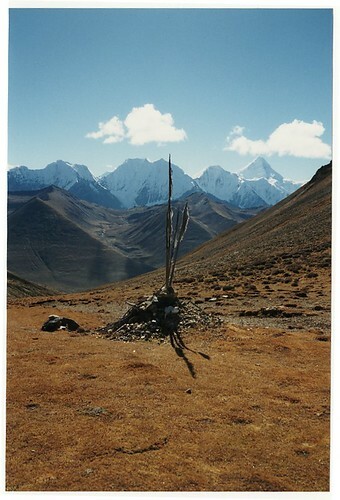 The Tibetans were masters of woodwork, but for some reason made no furniture for themselves. We kipped on the grimy wooden floor, but did not sleep well, as the house had an electrical clock that played a tinny but loud Happy Birthday on the hour. 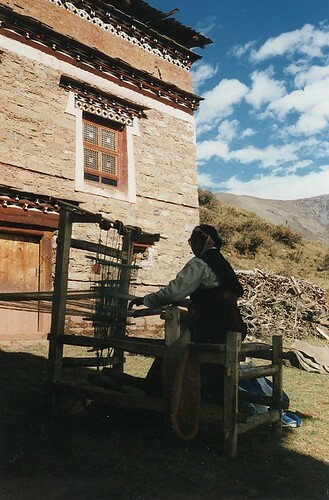 The grandma of the house was spinning wool and making clothes with an ancient loom just like the one seen below. A loom as seen by Joseph Rock in 1929. 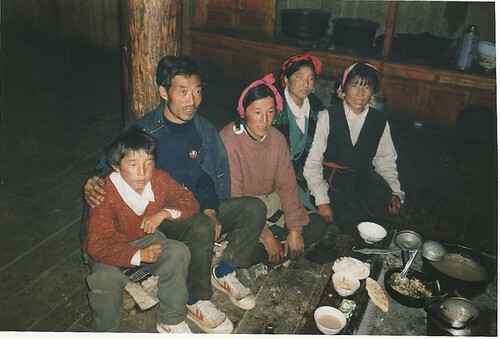 The Tibetan family that acted as our hosts at Yulongsi. 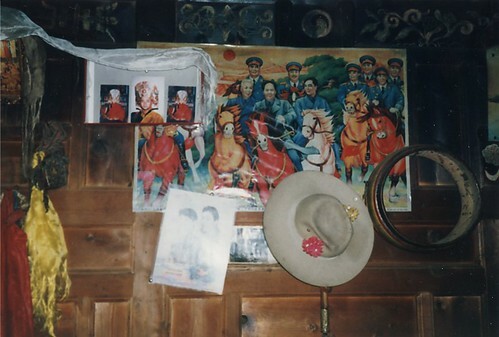 The walls were decorated with a weird tableau of Buddhist and Communist Party deities. It's sometimes possible to drive from Lugu Lake to Muli (Wachang - monastery, not Muli county town) by 4WD/SUV. You may be able to hire one in Lijiang or at Lugu Lake. But from Muli to Daocheng (I presume you mean via Yading) I am not sure. On my map there is a road marked from Wachang-Muli to Daocheng, but I have never heard of anyone travelling this road by car - many people hike from Muli or Lugu Lake - this is a popular trip for Chinese trekkers in May and October. 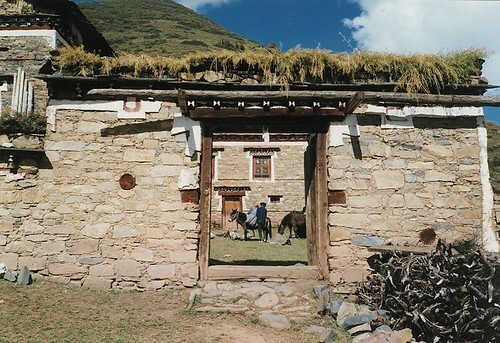 Muli (Wachang) has one or two small guesthouses, or you can stay at the monastery. Muli county town (100km south down the valley) has lot of hotels, but it is not a nice place and there is nothing to see or do there. It looks like we have to go back to Lijiang and than go up and just have to have a look if we can take a different route going up than going down! I can not get good maps of that area here in spain, I will be in london end of this week, what is the brandname of the maps you use? I don't use western (English) maps, they are generally not good for roads and for small scale. They only decent ones I have found are the Gizi maps from Czech republic, and the ONC (air navigation maps). I was walking, so I used the Chinese maps and trekker maps written by Chinese hikers. Google Earth is also good for this area. Can I male a suggestion about your itinerary? I think you should do it in reverse - first go to Weixi from Lijiang, because that part of the world gets very cold after Octoebr and the roads are blocked. Also, I think you will enjoy the road from Weixi to Deqin very much - it is dangerous and beautful. Make sure you stop in Cizhong Between Weixi and Deqin, it is worth a day stop for the catholic church. From Deqin you could go down to Zhongdian (I don't call it Shangri La) and then to Yading - Yading is the best place, much nicer than Muli for scenery. 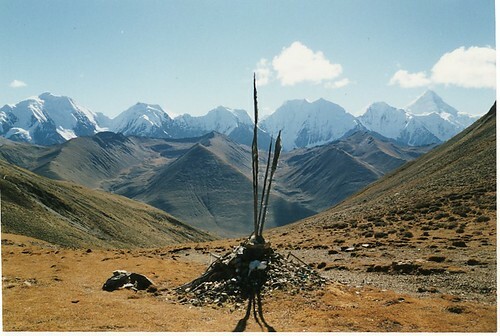 When you are in Yading you can ask if there is araod to Muli (Wachang) or not. 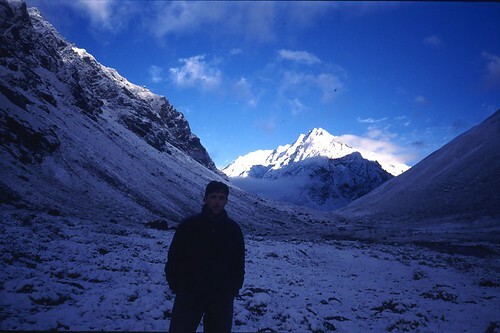 If not, you could go to Litang and then Kangding instead - and see Minya Konka mountain. Muli monastery is nice, but it is better to walk there, not take the SUV. The road from Lugu Hu to Muli is bad. 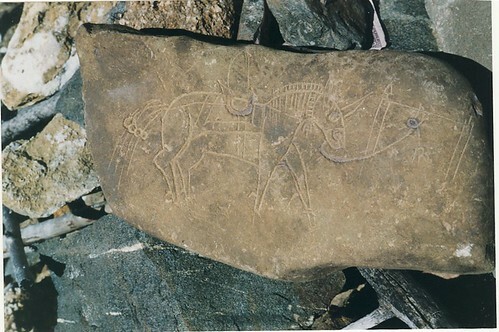 nice post and good scenaries and nice photography too,best of them is "detail of the stone carving on the cairn".